It’s been a real battle up until the past couple days to bring about spring storm chasing setups to the southern plains. But at least the brutal cold winter pattern finally gave way to spring in a meaningful way. There were severe storms including supercells, which did produce a few tornadoes from Texas to Missouri in recent days. But I do believe this is only a small taste of what mother nature has in store for parts of the Great Plains as we head into mid and late April. For months, tropical convection near and west of the international dateline has been a dominant feature. This has been primarily responsible for a persistent ridge over western North America and Alaska, promoting cold, arctic air intrusions into the central and eastern U.S. And through most of March, this cut off the rich, low level moisture supply from the Gulf of Mexico and can be at least partially blamed for a very slow start to the spring severe weather season across the central U.S. (namely the Great Plains). Over the past few weeks new tropical convection has emerged over the Indian Ocean, whereas the dateline convection stubbornly remains in place. Over the past several days it’s becoming more and more clear that the Indian Ocean convection is growing and may be emerging into a new MJO wave. You can see the two areas of convection in the images below. The first is a satellite image centered on Indonesia, while the other shows outgoing longwave radiation anomalies over a 3 day period (March 31-April 2). Infrared satellite image valid 02Z April 4, 2014. Notice the two areas of tropical convection. 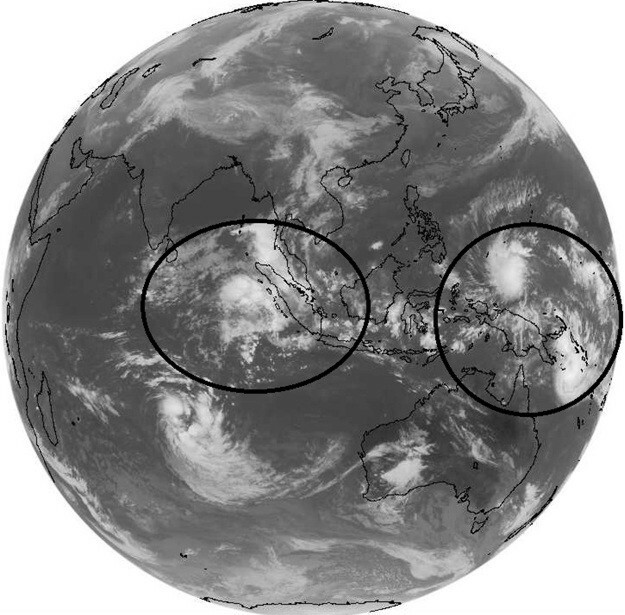 These may come together over the next few weeks as the main area over the eastern Indian Ocean moves east. Outgoing longwave radiation (OLR) anomalies valid March 31-April 2. Areas of blue and purple indicate negative anomalies, or areas where tropical convection has occurred. It’s probably going to be a slow and kinda messy process. But over the next few weeks the ‘blob’ of convection in the Indian Ocean should propagate eastward and slowly consolidate with the dateline convection in the form of a MJO wave moving into the western Pacific. And I use the word ‘messy’ because all throughout winter and early spring the dateline convection continued to fire and dominate the tropical Pacific, impacting the jet stream pattern. So it’s hard for me to imagine that dateline convection going away without a fight. In a perfect world the MJO would make it out to the western Pacific in mid to late April. This in turn would drive deep troughs into the western states and yield severe storms/chase setups across the Great Plains. Although, given this is April and not May or even June, there would be intermittent western ridges developing between major western troughs (see computer model forecasts for next week, western ridging building ahead of Pacific troughs). That’s just a factor of the jet stream wavelengths still being short, a leftover from winter. Anyways, as the MJO moves further east and makes it out to the western Pacific, more significant troughs should crash into the western U.S. and we should also see more southeastern U.S./Gulf of Mexico ridging as well. Essentially, a pattern that would allow rich low level moisture to lift north into strong westerly winds aloft, promoting severe storms across the southern plains. MJO plot as of April 3, 2014. Notice the latest plot is over the eastern Indian Ocean, indicating that area of convection may become the most dominant. 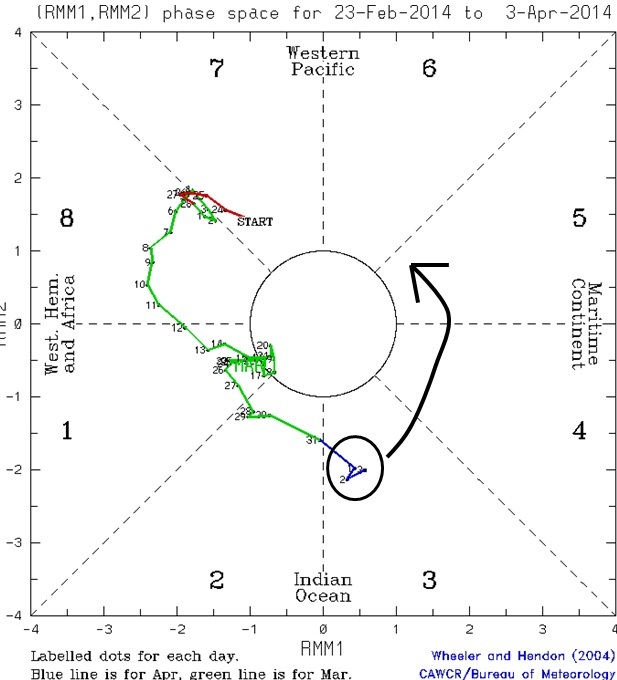 I drew in the black arrow myself, showing how this new MJO wave should move east, eventually towards the western Pacific later in April. BUT, this is a not a perfect world and the dateline convection IS a messy issue. What will probably happen is the dateline convection will bring a convective response in the form of intermittent ridging across the northwestern U.S. into western Canada, perhaps even into Alaska. But the Pacific jet stream will increasingly cut underneath this ‘block’ and crash into the southwestern U.S. We will also continue to see a subtropical jet stream as warm sea surface temperatures in the western tropical Pacific will support that. I think this is all very positive news for storm chasers..at least it is for me. The storm chasing season has been slow as we were frozen by the never ending winter. Predictions of El Nino have brought a lot of doubt to the future of the chase season going into May and June. And while this post has nothing to do with that, I’m simply pointing out a sub-seasonal weather event that may bring some decent severe storm events to the Great Plains in mid and late April (perhaps into early May?). Whether or not El Nino develops is a topic for another blog post (if I ever get around to that!). I will say this: If El Nino does indeed begin developing in earnest by May, that is not a good sign for the remainder of the chase season. There is no easy way around it. It has been a long, cold, rough winter for most of us across the U.S. Or, at least it has been for storm chasers looking for early spring chasing activity. And while the cold winter pattern doesn’t want to give up across the northern parts of the country, mother nature has had enough over portions of the southern Great Plains. We’re finally seeing Gulf moisture returning north into Texas, warmer temperatures, and a general sense that spring is in the air. The jet stream is also switching gears. For months the polar jet has been in a blocking position, allowing brutally cold arctic air to continue sliding south from Canada into the U.S. It has also blocked Pacific storm systems from making headway into the western U.S. and plains states, which are typically key to help trigger severe storms. But finally, the Pacific weather pattern is changing its tune. 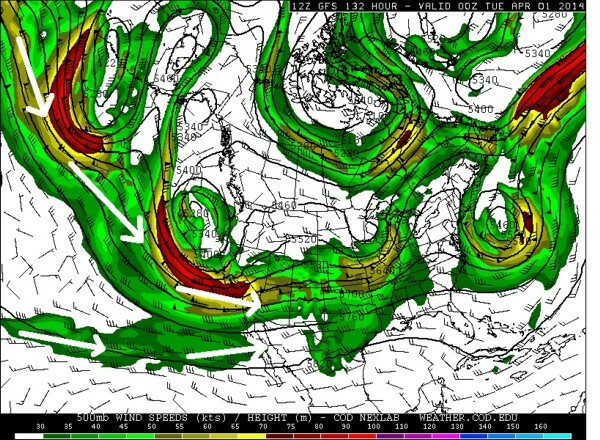 The Polar jet stream is shifting and the subtropical jet is coming to life. At last we have the beginning stages of severe weather setups across the southern Great Plains in the coming days and weeks. 12z March 26 GFS Operational model 500mb forecast valid 00z April 1. Notice the white arrows indicating the polar jet stream over the north Pacific heading into the western U.S., along with a subtropical jet stream coming from the equatorial Pacific. But wait, I wish it were that simple and easy, but it’s not! While this new pattern (mix between the polar jet and subtropical jet, see graphic above) will undoubtedly bring storm systems into the southern plains over the coming weeks, low level moisture may indeed be a huge issue. The problem is arctic air sitting over eastern Canada isn’t quite ready to retreat north, and that’s because the base state of the atmosphere continues to favor cold air intrusions over eastern parts of the U.S. This may be enough to limit the supply of quality low level moisture into parts of the Great Plains. At best there will be room in-between cold fronts for moisture return northward and severe storm setups over the southern plains. At worst, however, cold air intrusions will cut-off the Gulf moisture supply and storm systems across the plains will have poor moisture to work with for severe storm setups. This will lead to marginal setups. The good news is there will at least be storm chasing opportunities heading into late March and the first week or two of April given the jet stream flow. But it will take some work from the atmosphere to get all the right ingredients together for severe storms and tornadoes — more than normal for this time of year. But seriously I’ll take it. It’s been cold and it’s been snowing for far too long. It’s time for something different, something new..it’s time for storm chasing season to begin. And even though this is a slow start, we have to start somewhere, right? Until next time…and seriously sooner rather than later! It’s really late so I’ll try to make this brief, but after such a successful day I had to find some time to at least post a few photos. 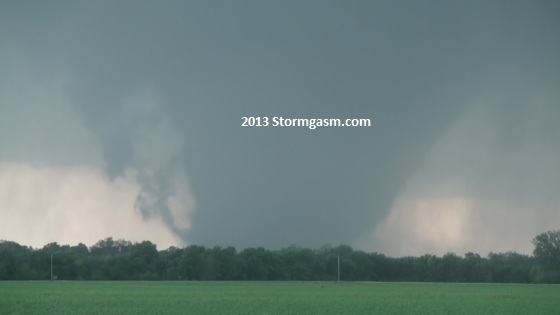 Today I documented a large, violent tornado near Bennington, KS. I had targeted the Salina area for storms to develop along the warm front near the pseudo dryline intersection. Well the forecast worked out well and a supercell indeed developed just northwest of Salina. Before long it became a monster storm just west of Bennington. 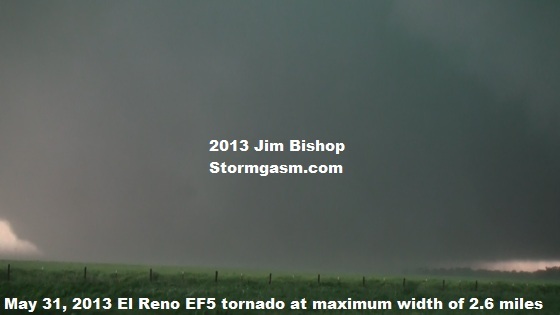 The tornado developed and quickly became a large cone/stovepipe, becoming wrapped in rain a couple different times before transitioning into a large wedge. When the wedge transition occurred, I re-positioned a mile or so to the north to get a better shot, hoping I would be able to see around the rain. The re-positioning did get me a better short for a little while. But with time this storm became the monster of all HP supercells. 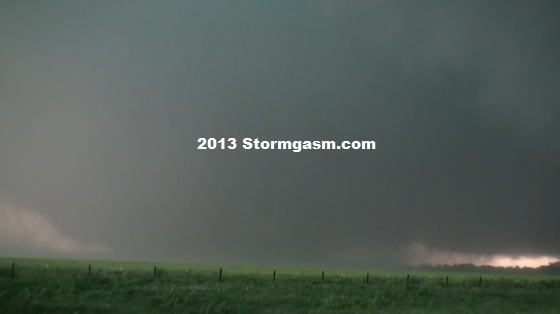 Wedge tornado near Bennington, KS. Better late than never. 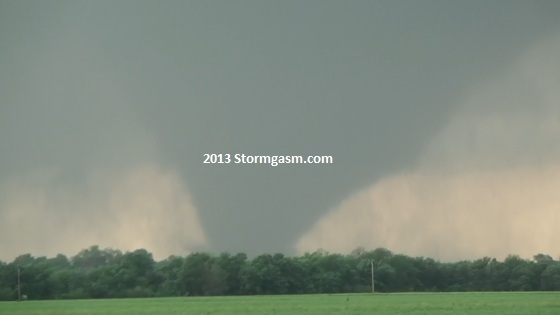 I finally had the chance to edit and post my tornado footage from May 19 in central Oklahoma. I was chasing along with Simon Brewer and Juston Drake, who were in a separate car. We also brought along Juston’s sister Mechel, who had never been storm chasing. We documented a rope/mutli-vortex tornado in Edmond, OK. Then the supercell produced a stovepipe that became a wedge near Carney, OK. 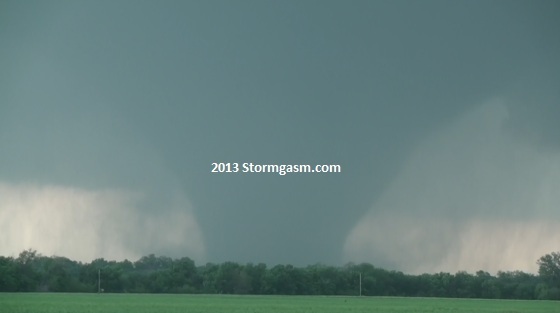 The terrain wasn’t great but I managed to get some footage of both life cycles of the tornado. Eventually the supercell became a HP beast and into an area with a poor road network. Thus, we decided to drop the storm and head south towards a new supercell southwest of Norman, OK. That storm soon produced a tornado that we documented near Dale/Shawnee Oklahoma from I-40. It has been a very busy past few days. I attempted to write a post at the airport on Tuesday on the way home, but that proved to be both too time consuming and much too difficult. At the time I had only slept for about 3 hours two nights in a row. Not to mention the fact that after the Moore, OK tornado and chasing other tornadic supercells across southeast Oklahoma that evening, I needed to find a town with good cell phone reception in order to do a phone interview on CNN with Piers Morgan that night. Afterwards (it was around midnight by then) I had to drive all night back to Wichita – grab a 3 hour nap – and then catch my flight. And remember, upon returning home I went back to work the next day after yet another short nap for sleep. So, it might be appropriate to say I’ve been a little busy! 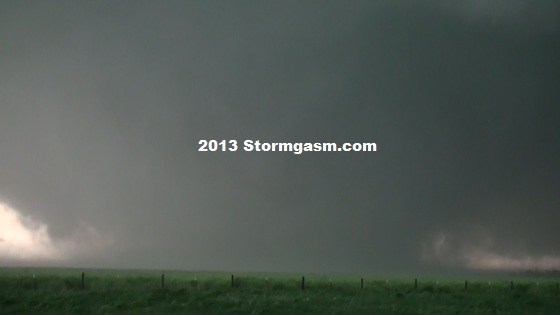 So today, after finally having the chance to catch up on sleep, I finally found the time to edit video from May 18 in Kansas. 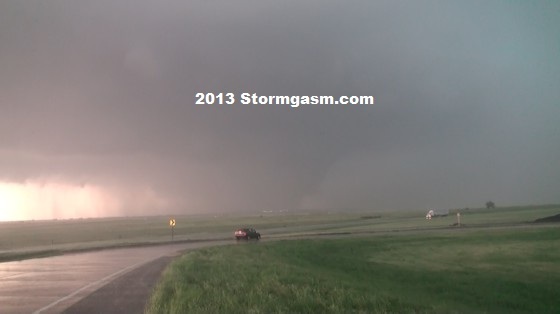 The first tornado was near the town of Rozel, KS and has been rated EF4. I was standing about a half mile or so east of it for a while. Eventually it came much closer to me. I was probably a couple hundred yards away at one point before I had to leave my position. There is more video of the tornado after it crossed the highway and for a few minutes after that, but I didn’t want this clip to be too long. 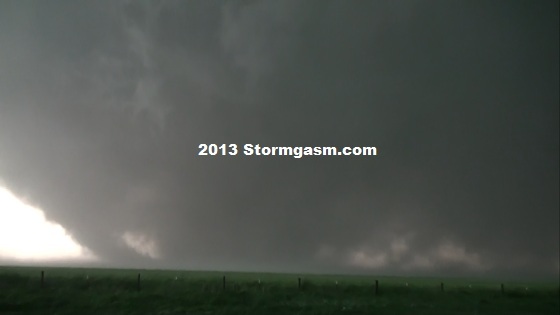 In fact, I had to cut a lot of video from much of this tornado’s life to keep this clip short. 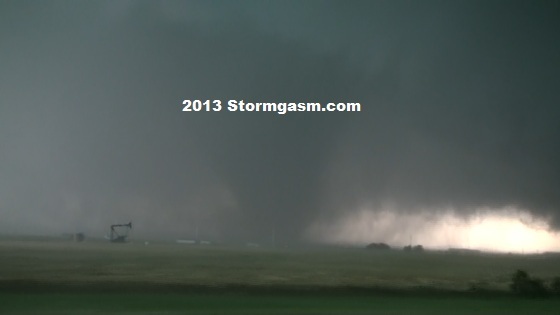 (I don’t normally have issues with too much tornado footage…this was an extremely successful chase). 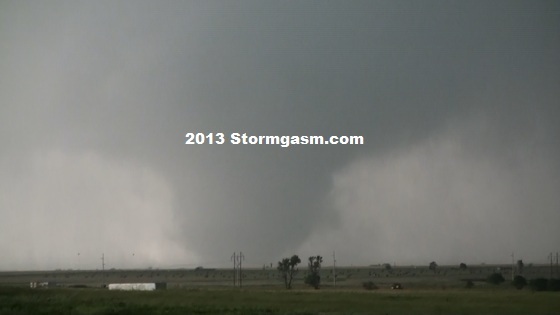 The second tornado developed further east with the new mesocyclone a bit west of the town of Larned, KS. 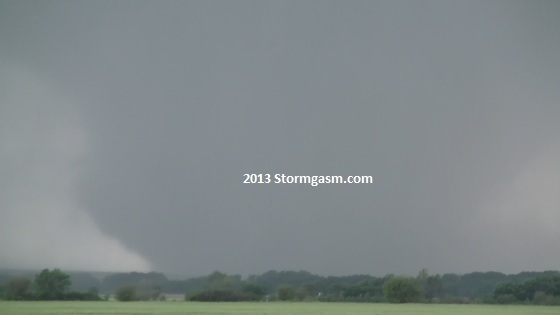 This tornado quickly became a beautiful elephant trunk and had a very long rope out stage. Both tornadoes did little damage, which is always a good thing. In fact the only reason the Rozel tornado was rated so high (EF4) is because the doppler on wheels mobile radar was getting readings and measured wind speeds between 165 and 185 mph, supportive of an EF4 tornado. 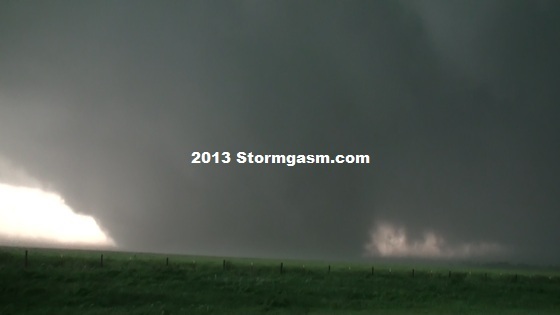 This goes down as one of my more memorable chase days. I got right up next to a slow moving, photogenic, violent tornado harmlessly passing through a field. The Rozel tornado did pass by a farm and one or two homes were damaged. But nobody was hurt and the tornado, for the most part, missed the town. It’s unfortunate that homes were hit, but I’m glad no further damage occurred and that nobody was hurt. As a storm chaser, you want to see a tornado pass harmlessly through an open field like this tornado did for most of its life. 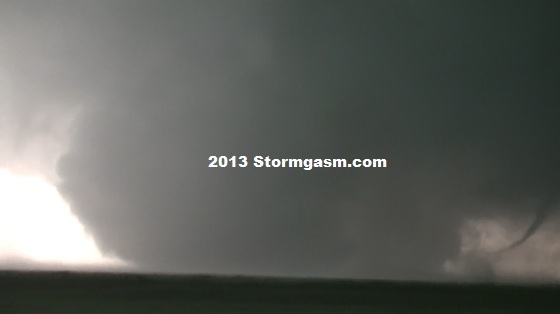 And the second tornado west of Larned, KS danced around open fields for it’s entire life.